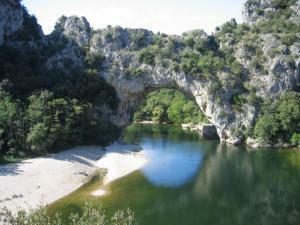 To spend holidays in the gorges of the Ardèche is to go to a unique and protected place. 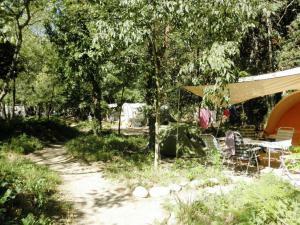 The campsite of the La Plage des Templiers is situated by the river Ardèche in the heart of the canyon. 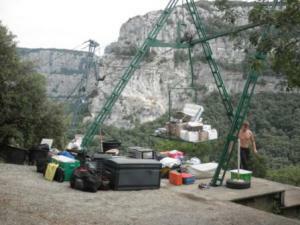 The campsite develops on the shaded slope or are implanted location of campsite'places and the installations. The parking lot is situated on the top of the ground, in the wood of oaks near the tourist road of the Gorges of the Ardèche. To connect the campsite, one cable railway in cable allows to go down luggage, and the campers make the descent towards the campsite on 400 meters by a small pedestrian path. Twilight hike in the Nature Reserve with a naturalist guide to the Maladrerie des Templiers. 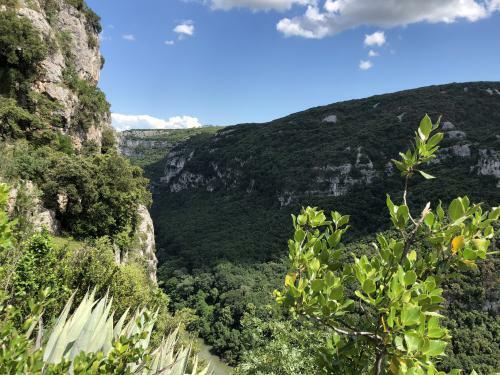 During this short hike you will discover the fauna and flora of different natural environments: the banks of the Ardèche, the cliff, the forest of green oak. At this quiet hour of dusk we may have the chance to observe a beaver, a heron, a boar or an otter ..
Easy hike around the site in search of wildlife trails. Just like the trappers of Chauvet Growers, you will learn how to recognize edible plants and read the presence signs of wild animals. Equipment to be provided by participants for all walks: good walking shoes, backpack with water (at least 1l per person), picnic, flashlight. If you have binoculars or works of naturalistic determination: take it. The animators are graduates as a certificate of State accompanying in Middle Mountain. If you wish to spend holidays in the campsite of La plage des Templiers, it is with pleasure that we shall receive you from MAY 25th of 2019. While waiting for to receive you under the sun of Ardèche. The team of "La plage des Templiers"
The Naturist campsite of La Plage des Templiers is situated in an exceptional natural classified environment national nature reserve. You will have the privilege to be the hosts of this magnificent place. It is thus up to you to respect it by limiting at most the rubish. Think of it in packing your luggage by deleting all the superfluous packagings, by using respectful products of the nature and the energy-efficient devices. Respect the fauna and the flora. Barbecue individual and fires are strictly forbidden. A collective barbecue is at your disposal. The team of La Plage des Templiers recommends you to use composter so as to transform on the spot the organic waste. During may and june the lift is open from 9AM till 11AM and from 2PM till 4PM, please phone half of an hour before arriving. For starting day, transport of luggages with lift is possible between 9AM and 2PM. The cost is 16€ for a round trip(max charge:150kg). Change your habits, choose to rent and travel light and carefree! 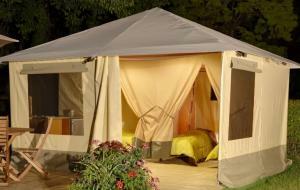 These tents are lodge Amazone with wooden structure on a floor of 28M2. They consist of 2 rooms with beds, a living and kitchen and a covered semi terrace. They are perfectly integrated into the natural environment of the campsite(ca and ally comfort and aesthetics. These tents in metallic toilée structure of 16M2 consist of 2 rooms of a kitchen area and a stay and furnished. They are equipped with a stove of cooking and of a refrigerator top of 100 liters. Bring your hiking shoes !! 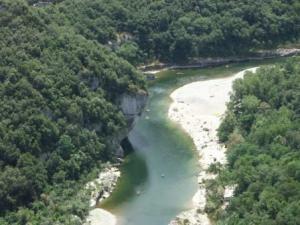 The wonderful Pont d'Arc is also the nikenamed the "natural gateway" of the Ardeche Gorges. 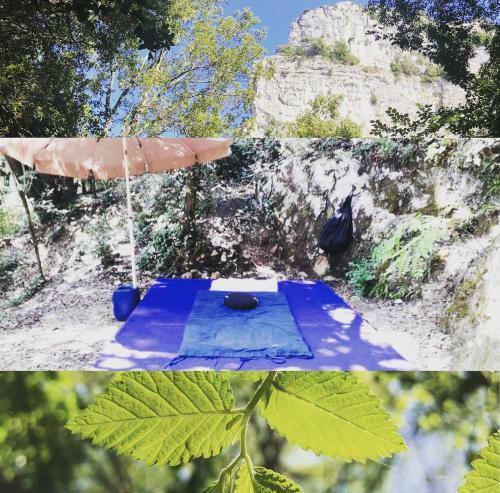 Naturist campsite: a wild and unique landscape to recharge one's batteries in heart of Ardeche Gorges. 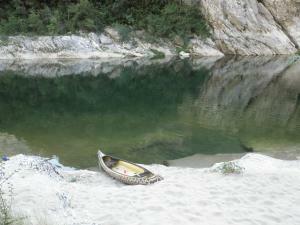 A big stretch of water and small rapids, a magnificent beach on more than 800 meters with small creeks of fine sand.